PlayStation 4 Pro 1TB Limited Edition God of War Console Release Date, Pre-orders LIVE! Pre-orders for the anticipated release of the PlayStation 4 Pro 1TB Limited Edition Console – God of War Bundle are LIVE at Amazon! 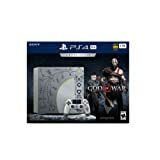 Includes a fully customized PS4 Pro console inspired by Kratos’s Axe, a Leviathan Gray DUALSHOCK 4 controller with insignia, God of War game on Blu-Ray disc, and digital content. It is a new beginning for Kratos. Living as a man outside the shadow of the Gods, he ventures into the brutal Norse wilds with his son Atreus, on a perilous journey to fulfill a promise. On PS4 Pro, 4K TV owners can experience the game in a stunning dynamic 4K resolution, while HD TV owners will benefit from increased image clarity. The PlayStation 4 Pro 1TB Limited Edition Console – God of War Bundle has a scheduled release date of April 20, 2018. Previous PostPrevious Spyro Reignited Trilogy PS4 Xbox One Release Date, Pre-orders LIVE! Next PostNext Recommended Release: God of War 4 on PS4!